Another 5-ingredient recipe, one of which turned out just how I thought...bland and boring. Still, it's filling and satisfying enough to have for leftovers for at least a couple days. I love zucchini, and I love Parmesan, but that still didn't do enough for this dish. Instead of adding half the Parmesan in during cooking and sprinkling the rest on top for serving, I added it all in at once during cooking, thinking I'd get an extra cheesey pasta. Wrong! The Parmesan clumped up (not a great melting cheese, I must say) and did not combine with the pasta water to create a sauce. 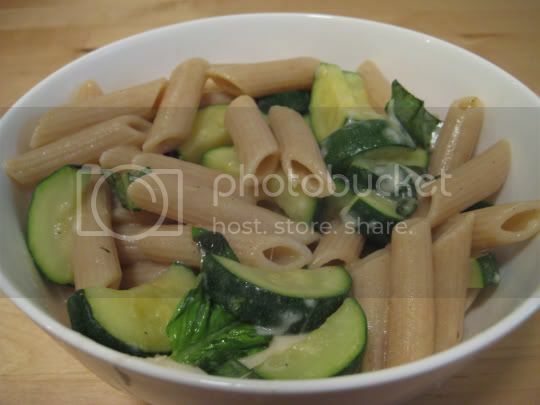 So, one mouthful of this dish was pasta, olive oil, and zucchini, and the next mouthful added a chewy heap of Parmesan. Not bad, just not great. But, what can you do with 5 ingredients, 3 of which don't really have any flavor? Make again? If I'm looking for a cheap meal for the week.